Mar 10 Not so wee wee. Ha! I kept thinking how to introduce these "not so wee" bunnies, and as you can tell, didn't really come up with a good way. Oh well! But here they are. And let me tell you, adding 2.5 inches to these dolls proved to be more than I was thinking. I mean, why can only two inches wreak havoc in my usual line-up? Shouldn't be that difficult, I thought. Well, now I know better. These "Not So Wee Babies" took me quite a lot more time than their little brothers and sisters. To sculpt the head differently, was requirement number one. Done. They are too big to not have a nose! Done. Nose and all. They need pudgier cheeks for sure. Done. And turns out that their core needed to be needlefelted before stuffing it into the body or the whole thing looked like a floppy mess. Add several, and I mean several, more hours to the whole thing and phew! here they are. Glad that is done. They are not as squeezy-soft as the little ones, but they are still a pretty good size to sleep with and cuddle with. Now that they are hopping and romping about, I can dedicate my attention to their wee brothers and sisters, so that I can hopefully have them ready to meet you too. These four Wee Rabbits, measuring approx. 10.5" tall, will be ready for sale tomorrow morning in my Etsy shop (yay! different time!!) at 10:00 AM EST. They each cost $85 USD plus postage (more photos of them in the Gallery).. They come with a tiny wee surprise, which of course I wanted to leave out, it's a surprise!. 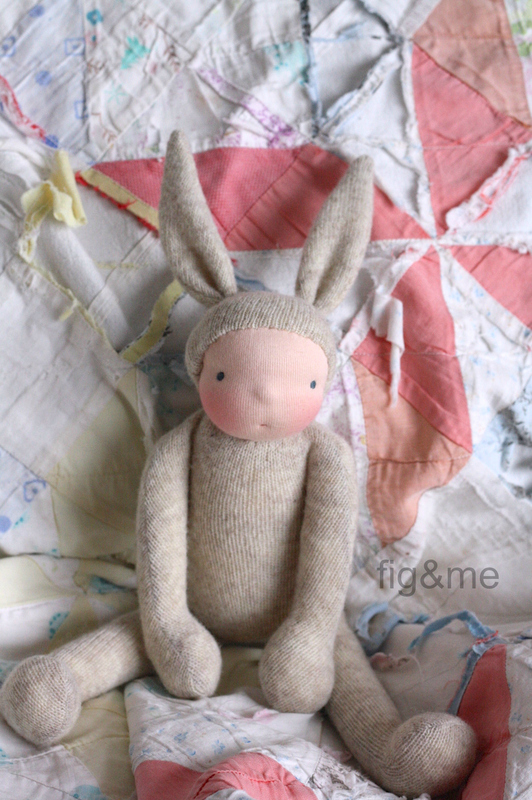 Somewhere mid-week I will have a small batch of Wee Bunnies (the 8" kind), and by the end of the week a few more british cousins, velveteen rabbits and teddies. See how hard I have been working? I have been a good dollmaker all week!. And for those of you who long to see another large doll grace these pages, now that my love Darcy left me, well...let me tell you, you are in for a t.r.e.a.t. This doll has been the object of so much discussion, of so much dreaming, so many words have been said about her already, and yet, she keeps captivating my every thought. I don't want to dive into her clothes just yet because the bunnies are starting to make a mess, and she is so dreamy and interesting, I really want to devote all my attention to her. But I can tell you one thing about her, she has a gypsy soul. Enough rambling! This dollmaker will now proceed to sew and stuff more tiny bunnies and maybe eat something, she has forgotten to eat...again!. Hope you all had a nice Sunday, and you didn't forget your victuals!. Mar 14 A flurry of wee ones. Mar 8 Nothing short of amazing.